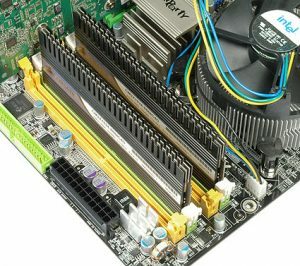 Strange RAM problem - memory not recognized by Windows 7 but identified in a Crucial scan - PC Buyer Beware! It all started when one of my desktop PCs wouldn’t boot past its startup logo screen, which displayed vertical lines through the image. Strangely, it all ended that way too. The system was using the latest BIOS. There was no dust problem inside the case, so I removed the four RAM DIMM memory modules from their slots in the motherboard, cleaned their connectors with a rubber eraser and re-seated them . There are no expansion cards because the Microstar MS 7093 motherboard provides an integrated ATI Radeon Xpress 200 series graphics chip that has its VGA port in the motherboard’s ports panel at the back of the case. The sound is also provided by an integrated chip, so no separate sound card. After doing that I decided to change the AMD Athlon 64 X2 (dual core) processor for its predecessor, an AMD Athlon 64 3000+ (single core) processor. Someone gave me their working monitor, which has a bigger screen than mine, so I changed my monitor, assuming that the old one was working because it had been showing the slightly distorted startup logo screen. Note well that a 32-bit operating system (Windows, Linux, etc) can only use 3.2GB of memory. Only a 64-bit version can use all of the memory that can be thrown at it. Moreover, a 64-bit system requires twice as much memory as a 32-bit system, which, of course only applies when the memory is 4GB and under. I have just over 2GB installed for a 32-bit version of Windows 7, which can be increased to 4GB but only 3.2GB can be used. If I had a 64-bit version of Win7 installed I would have to have the full 4GB installed in order to have the same level of performance. Only a 64-bit version can use 4GB+. For a 64-bit system, you can install as much memory as the motherboard can take and it will all be used. With the PC connected to all of its cables, I crossed my fingers and pressed the Start button. The MSI logo appeared and the system started booting and booted all the way into Windows 7. Beautiful! There was a small problem though. Windows 7 was only recognizing the memory in the first and third slots, a total of 1.5GB out of the total installed of 2.256GB. Slot A0 – 1024MB – Slot A1 – Empty – Slot A2 512MB – Slot A3 Empty. The four memory modules installed were – 1024MB, 512MB, 512MB and 256MB. So, the first 512MB module and the last 256MB module were not recognized. This was confirmed when I ran and looked at the hardware results of Belarc Advisor. The Memory page from the motherboard’s manual shows which capacities of DD3 memory can be installed, either as single modules or two modules running together in dual-channel mode. If you fill all four slots, if the memory is working and installed properly, all of them should be recognized. Click on the link below to read that page in the PDF format. The last sentence: “Do not support three memory modules” must mean that triple channel mode that a few Intel processors support is not supported. Since all of the memory is made by Crucial, I visited the Crucial site, downloaded and ran the Crucial System Scanner. The results are shown in the image below. Click on it to view its full size. As you can see, the Crucial scan shows all of the installed memory. Despite the reduced memory, the system was working surprisingly well using the single-core AMD Athlon 64 3000+ processor from 2005. I decided to buy a dual-core Athlon 64 X2 4200 processor from eBay, which dates back to 2006. When it arrived, I installed it. It managed to boot all the way into Windows 7, but then the system switched itself off. That was all it could do a couple of time. Upon looking at the pins using a magnifying glass, I saw what the problem was – three bent pins – flattened at one edge of the processor. If I tried to straighten them, I knew that I would either break them off or flatten others, so I just removed the CPU. Instead of reinstalling the 3000+ single-core CPU, I tried installing the 3800+ dual-core CPU. Amazingly it not only worked perfectly, but Windows 7 recognized all of the installed memory. Therefore, only my monitor had failed. I tried using it on another working PC and the same thing happened. Only the startup screen with vertical lines through it was displayed. I have no idea why the single-core 3000+ CPU failed to recognize the memory in the two DIMM slots. 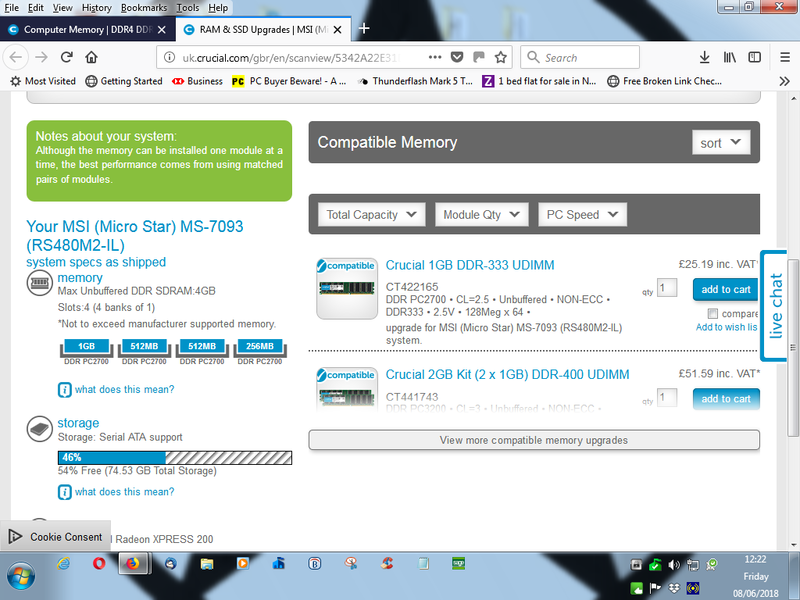 Later on, I bought a 2GB kit of brand new Crucial RAM consisting of 2 x 1GB modules. I installed them along with the 1GB and 512MB modules that I had, making a total of 3.5GB. The BIOS recognised the 3.5GB and the system booted all the way into Windows 7, but the system suddenly became unusable. A reboot also failed. I tried the new modules on their own and Windows 7 booted properly, so I added the other 1.5GB and Windows 7 booted all the way but then became unusable again. To fix the problem all I had to do was remove the 512MB module. I am using a 32-bit version of Win7, which can only recognize a maximum of 3.2GB of memory. A 64-bit version can recognize all the memory that can be installed on the motherboard – 16GB+. Therefore, 32-bit Win7 won’t work if more than 3GB is installed. The extra memory above its ceiling must have made it become unusable. June 10, 2018 in PC Problems and Solutions, RAM Memory Problems.